The REX Anterior Cervical Plate system consists of a variety size of main plates, screws, sub-plates, rivets and associated instruments. 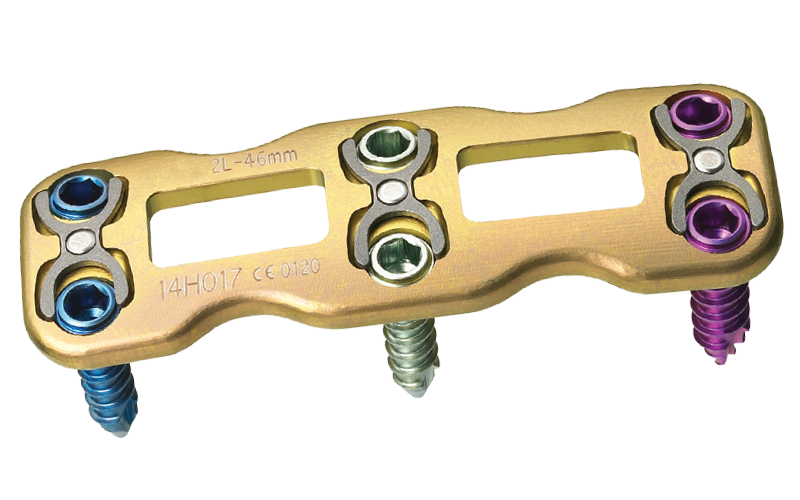 The sub-plate is pre-assembled to the main plate and designed to prevent screws from backing out using the elastic behaviour during the screw insertion. The rivets are also pre-assembled to the main plate and designed to assemble the sub-plate to the main plate firmly. Each component is subjected to a colour anodising process to differentiate the screw type and diameter and to make the surgical process easy. The main plate has windows in the middle of the plate. 16mm wide and 1.8mm thin. Class IIb according to the Rule 8 of Classification Criteria, Annex IX, MDD 93/42/EEC. Class II according to the QSR:21 CFR.820./col. Each screw type is also available with diameter of 3.5mm and 4.0mm. screws are colour coded to identify function and diameter. Degenerative disc disease (ad defined by neck pain of discogenicorigin with degenerative disc confirmed by patient history and radiographic studies). Deformity (defined as scoliosis, kyphosis, or lordosis. Each screw type is also available with diameter 3.5mm and 4.0mm. Variable type screw lengths range from 10-20mm. Fixed type screw lengths range from 18-26 mm. Screws are colour coded to identify type and diameter.